There is no doubt that summer is here, and in some parts it's sizzling hot. Many areas will experience temperatures of over 100 degrees with night lows in the high 90s to 100. This is the time to be very aggressive about hydration and protection from hot weather. Slushies prepared with shaved ice in the blender; hydration powdered beveraged used for flavoring (mix per package, place amount needed in blender, add chopped ice, blend). 8 oz. of ice water with every meal (breakfast, lunch and dinner) in addition to the other beverages served with meals. Caffeine is a diuretic, so limit caffeinated beverages, including iced tea. Sugary beverages do not quench thirst, so use as less sugar or sweetener. Use sugar-free beverages for all hydration programs; everyone can have them. Add a splash of club soda to iced beverages before serving for a special treat. Iced (decaf) coffee, black or with milk or cream is popular with many. Be especially mindful of pets, especially dogs and cats don't sweat, and sweat is what cools us off. Keep them sheltered and have fresh water bowls available. If they run outside hose them off to provide cool down opportunities. Independence Day is one of the favorite holiday of the year, second only to Christmas. And why not? It’s summer and warm, school’s out, many take vacation, and this great holiday breaks up the routine. Traditionally there’s food involved, usually outdoor BBQs which are very popular all summer long. If the day is smoldering hot there’s no better way to start off the festive meal than with a chilled bowl of tangy, spicy delicous Gazpacho. Enjoy a favorite from my collection. Chop or dice all vegetables - the size is up to you but the smaller the better results. Bring it home with a few slices of fresh creamy avocado! Incorporating eggs into every day foods and beverages is an easy and inexpensive way to increase high quality protein in your diet. My favorite way to eat eggs is deviled. Every week I buy a dozen medium eggs just to make Deviled eggs. The size of the eggs is not important, but the medium size happen to fit perfectly in my Deviled egg keeper with plenty of room for a thin ice pack in the bottom if I happen to take them to a party, or if leaving out when guests are over. I like mine perfectly chilled and paired with tomatoes. 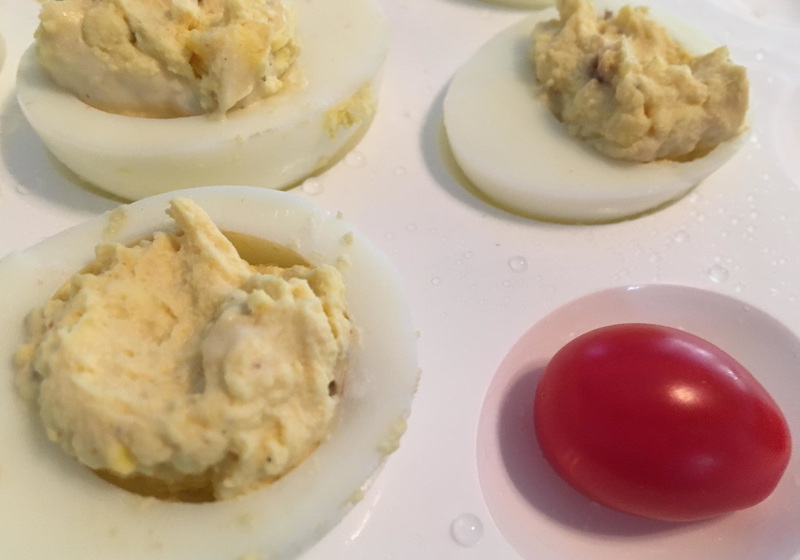 Why Deviled eggs? I’m not sure where the name came from, but with my girls and grandsons I always called them stuffed eggs, and that’s the name we still use now. 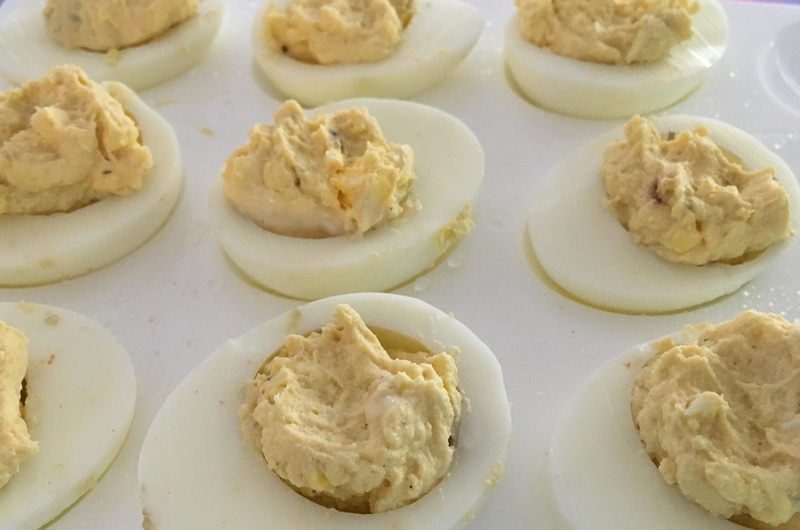 Deviled eggs aren’t just party food, or for a treat. I like to use them for snacks and meals. For light meals, paired with a whole grain bread or cracker and vegetable sticks there’s nothing better. Once you find the right container they pack well too, and children love nothing better than to be the only ones not eating sandwich at school. Mine always thought that only treats came in small bite size finger foods, so imagine their thrill and their friend’s wonder when they unpacked a bunch of “treats” for lunch. I like mine for breakfast. Today’s busy life style seldom allows time to prepare special, nutritious meals, so most people resort to supplement drinks or bars. Athletes in particular struggle to fit in work or school, social life and other obligations, and extensive workout routines, and for some finding foods that provide enough calories and protein is a problem. Besides, since most of the available supplements are sweet, there is often flavor fatigue involved after only a few weeks of taking them. 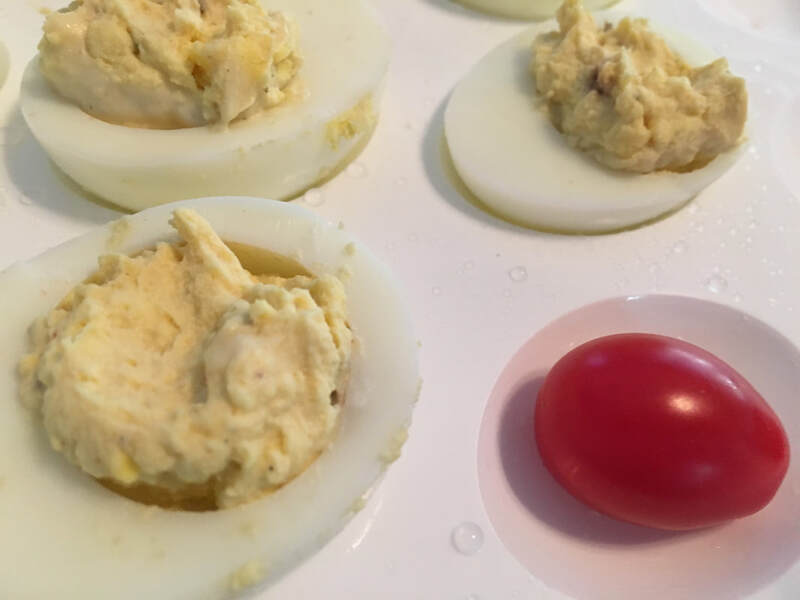 Try my Deviled (or Stuffed) eggs recipe – it’s so easy and nutritious! Cut hard cooked eggs in half lengthwise and carefully pop out the yolk. If it gets stuck use a small teaspoon to pry out without breaking the whites. Arrange the whites cavity side up and sprinkle a small dash of salt and pepper over them – I like to use a salt and pepper grinder on the coarsest setting for just a few quick turns. Mash the yolks with a fork then again with an upside down teaspoon to break any lumps. Mix mayonnaise, Pupon mustard, Cayenne, Chili powder, garlic powder, cumin and oregano. It’s best to add these to your own taste, as I like my food very spicy and some of you might not. Taste and adjust salt and pepper – you can’t forget the pepper! Add the dressings and seasonings mixture to the mashed yolks, mix well. It should be thick and hold its shape, but not too dry. Stuff each egg using two teaspoons, one to scoop and drip, and the other to scrape the mixture inside the cavity. Chill well at 41°F. Will hold a week covered and stored at this temperature, but I guarantee they won’t last that long. Incorporating eggs into every day foods and beverages is an easy and inexpensive way to increase high quality protein in someone’s diet without resorting to the large variety of powdered and liquid nutritional supplements available. Although there are many supplements available from commercial manufacturers that can help provide higher calories and protein, they are expensive and never taste as good as something home-made. Besides, since most of the available supplements are sweet, there is often flavor fatigue involved after only a few weeks of taking them. Today’s busy lifestyle seldom allows time to prepare special meals that provide the additional nutrients. Athletes in particular struggle to fit in work or school, social life, other obligations, and extensive workout routines. In addition some athletes have a problem finding foods that provide enough calories and protein. One egg has 75 calories and 13 essential nutrients in varying amounts, including high-quality protein, choline, folate, iron, and zinc. 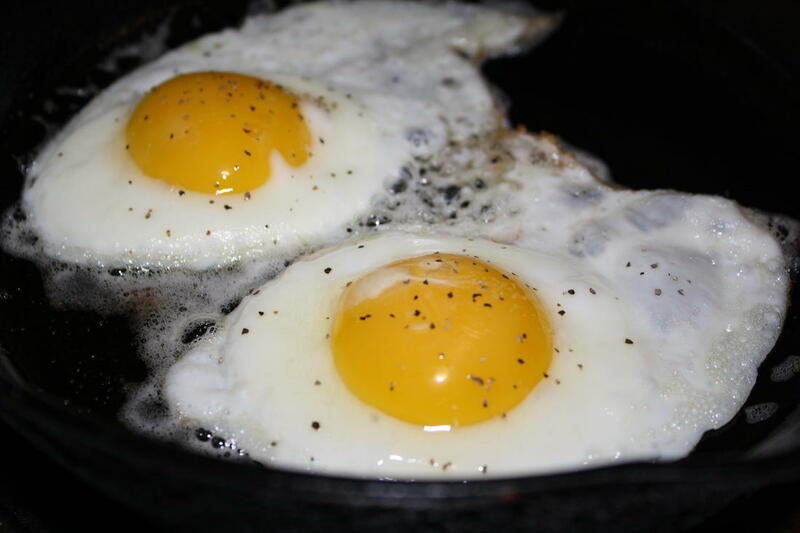 Eggs also play a role in muscle strengthh, brain function, eye health and more. When using fresh eggs, make sure they are safe to eat. Have you considered using liquid pasteurized eggs? When liquid eggs are pasteurized, it destroys salmonella, but it does not cook the eggs or affect their color, flavor, nutritional value, or use. Egg products can be substituted in reciped typically made with raw eggs that won't be cooked (for example, Caesar salad, Hollandaise sauce, eggnog, homemade mayonnaise, ice cream, and key lime pie). The USDA does not recommend eating raw shell eggs that are not cooked or are undercooked due to the possibility that Salmonella bacteria may be present. There are a number of ways to incorporate high-nutrient dense foods into the daily diet. Many simple and delicious recipes can be prepared at home with ingredients found in the cupboard. 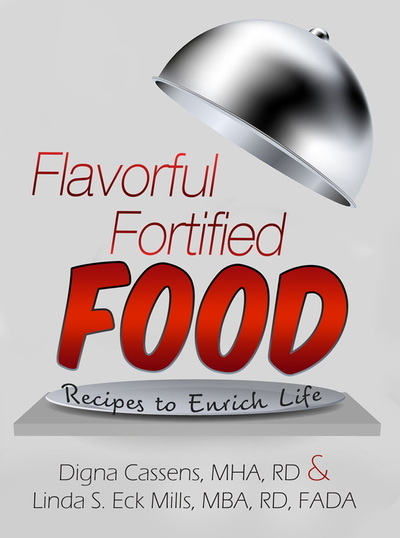 Flavorful Fortified Food – Recipes to Enrich Life provides 60 recipes and many options for additional variety incorporating eggs. September is National Honey Month, and pollination is vital to your diet. More than 100 agricultural crops in the United States are pollinated by bees. Without bees to pollinate many of our favorite fruits and vegetables, the United States could lose $15 billion worth of crops – not to mention what it would do to your diet. Researchers call the mass disappearance of bees Colony Collapse Disorder, and they estimate that nearly one-third of all honey bee colonies in the country have vanished. Bees are unwittingly killed daily by well intentioned, albeit ignorant gardeners using insecticides and pesticides. Pesticides, the most deadly of which are the neonicotinoids (neonics), are deadly to our eco-system, to us and our food sources. The kill bees, butterflies, bats, hummingbirds, moths, lizards and very small mammals. Would you like to live in an insect free environment? I sure wouldn’t! I do live in an insecticide and pesticide free home, and my 13 acres are never sprayed. Of course we have pests, they’re unavoidable, but with care and effort we’ve managed to let nature take care of its own balance. It’s taken 3 years, but we’ve reached our goal. We have a large number of birds of all species devouring not only the seeds and nectar I put out for them, but also this summer I noticed a significant reduction in most insects. What we do have more of is bees! In the early morning, as soon as the sun shines on the bushes and flowers, they’re covered with bees. We also have a lot of lizards and desert iguanas living in our bushes that feed on flies and other insects on our outside walls during the day; I get to watch them through my office window and when we sit outside in the vegetable garden area. If we get too many flies I set stinky pots around the property or use a farm fly catcher with an egg and milk in a small bowl attached to the bottom. To keep flying insects and moths in check at night we use yellow lights and have 2 bug zappers hanging on either side of the house. The bonus is that the turtles in the pond get bugs falling right over them, and the birds have a feast every morning, so they do our cleaning for us. Naled, a deadly poison developed in 1959 and never tested since, was sprayed from airplanes in a fine mist a few years ago in attempts to kill the Zika mosquito, decimating millions of bees. That’s millions of pollinators stopped from doing their jobs, and honeybees deprived of making their honey. Daily other pesticides are used in smaller amounts containing Clothianidin, Carbaryl, as well as neonicotinoids, or neonics. All will poison honeybees, bumblebees and monarch butterflies as well as all the pollinating species, and because of the feeding chain, lizards, small rodents and some birds. It’s important to know that although some insecticides kill the bees instantly on contact, others have slow effects that may last for up to 3 days before the bee dies. Neonics are slow acting. The treated seeds sprout into crops that when eaten by the insects act by slowing down their nervous system, shutting it down, causing the bees to lose their ability to learn and communicate. We all agree that controlling many insects is important, especially when those insects cause devastating harm, such as the Zika virus. However, while attempting to control the short-term danger, we cannot afford to create long-term even more damaging danger. If we don’t act now to save the bees it might be too late. And no bees will mean an end to your favorite fruits and vegetables. Can you imagine life without almonds, apples, apricots, avocados, blueberries, cherries, cranberries, figs, grapes, olives, peaches, pears, plums, raspberries, strawberries, broccoli, carrots, cauliflower, celery, cucumbers, onions, pumpkins, melons, peanuts, soybeans, sunflowers? And the list goes on to include the honey we all enjoy. ​In this really hot weather across the country right now, you might just scream for ice cream in an attempt to cool off! It's cold, and contains a lot of nutritional value. But, what flavor do you like? According to the International Ice Cream Association, Washington, D.C., here are the top 15 favorite ice cream flavors and the percentage of individuals who like that flavor, with good old vanilla still out front by a wide margin. What’s your favorite ice cream flavor? I only have a few, vanilla, coconut & strawberry. But the most favorite in my ice cream book, is this super easy vanilla bean coconut ice cream. It brings me back to my childhood in a tropical island. Cover and freeze the ice cream for at least 5 hours. It should be firm but creamy. Although this ice cream won't last long, it will keep covered in the freezer for up to a week. I Love Honey! do you? I love honey for many reasons.Honey is a very versatile ingredient that can be used by itself as a sweetener, or incorporated with other ingredients for cooking and baking. It adds moisture and flavor to foods. Although nutritionally honey is not a major contributor it’s flavor can’t be topped by sugar or any processed syrups and sweeteners. Using honey in baking and results in a very moist bread, cookie or cake. I do not buy processed commercial honey; only local honey sold in jars from local beekeepers. Local honey is the best for me as it comes from local honey bees and I’m certain there are no extenders to lower the cost or other additives. 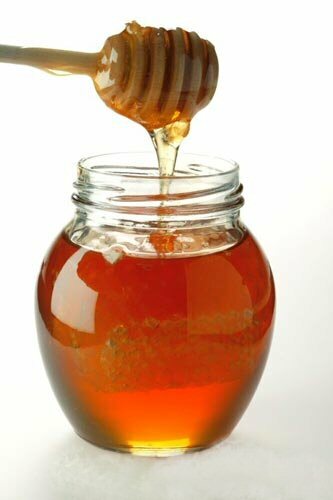 I eat a teaspoon of honey in the morning to help with my allergies. If I keep some too long and it crystallizes it’s easy to restore, just adding a teaspoon or two of tap water right in the jar, and zapping it in the microwave for 15 - 20 seconds. Be sure you remove the lid before doing this. If once isn't enough try it again, just be sure you don't overheat it and boil it over. You'd have a big sticky mess if this happens. If you prefer you can use a saucepan with instead. Whatever you do, very hot honey will burn so be careful. Fresh honey has a clear amber color, the exact shade depending on the pollen source and time the honey has been kept in storage. Do not use cloudy honey, but if honey turns a very dark color it just means it’s probably over a year old. Since it’s a shelf-stable food there’s no danger and can still be eaten safely. I’ve been given old honeys and soften them with the same method. Love honey? Help protect the bees, don't use harmful insecticides and plant bee attracting flowers. Vanilla is one of the most versatile and exciting of all spices. It is a flower in the orchid family originating in Mexico. Many tropical countries cultivate orchids, so it's natural that the vanilla plantm the V. planifolia orchid grows easily and abindantly in these countries. Vanilla was discovered in the New World, quickly becoming one of the most popular and coveted flavorings. Its versatility lends it to many uses, once harvested and dried it stores well, and when processed into an extract it preserves for years. The name vanilla developed from the Spanish word describing the source of its unique flavor, the “vainas” or pods. Its strong aroma is easily identified, and I for one, love it. Vanilla can be used for either sweet or savory foods. Use only an authentic vanilla extract or the vanilla beans. Beware of the cheap imitations you find in other countries. They’re made by combining small amounts of vanilla extract with Tonka bean extra. The Tonka bean contains coumarin and is banned from its use in US food manufacturing because it’s been shown to cause liver damage. What’s your favorite way of using vanilla? I enjoy using it either sweet or savory dishes, and one of my favorites is vanilla rice. There are many recipes for this delicious, aromatic rice, but I prefer mine without any sweetness. Bring 1 ½ cups reduced salt chicken broth to a boil. Add 1 ½ cups long grain rice (Basmati is the best), bring to a boil for 2 – 3 minutes until liquid starts to evaporate. Stir once bringing up the bottom to the top (folding motion). Cover and simmer at the lowest possible fire for 20 minutes. Check for doneness. If water is evaporated it’s OK to stir it now. If there is water remaining cover and continue cooking until all water is gone. Serve with any Indian or Chinese food. I like it plain for breakfast with a side dish of pumpkin or squash in season sprinkled with nutmeg. For a complete meal try a gingered meat and green vegetables with a bit of bitterness such as Kale or Mustard greens. They’re a perfect combination! Do you have a favorite recipe using vanilla? ​Why recipes for Group Homes? As a consultant registered dietitian nutritionist in long-term care communities, I plan menus and develop recipes that meet the nutrient needs of those residing there. Knowing that it’s not enough to meet nutrient needs, but that food also needs to meet the emotional and cultural needs of those eating it; my goal is to serve flavorful, nutritious food prepared with fresh and wholesome ingredients. The flavors and aroma and the comfort of nurturing food stimulates the appetite of even the pickiest person. Group homes are private residences for children or adults with chronic disabilities requiring specialized care. Typically there are 6 to 8 residents of different functional ability living with trained caregivers. Some residents require total care and others are able to perform simple self-care tasks, including supervised simple meal preparation. This recipe book is written in response to many of my group home clients as well as families caring for their own members with disabilities. Busy schedules require nutritious simplified meals, and this recipe book meets those needs. Group Homes promote a home-like, non-clinical environment and therefore the menus are liberalized with few restricted diets. Since all recipes are complete with nutrient analysis and include carbohydrate, protein and fat levels, so called “diet” foods are not needed. These are real food recipes just like you use at home. All the recipes are made from common readily available ingredients while still offering some conveniences and ease of preparation. Meals prepared using these recipes meet most health guidelines, providing less than 30% fat, using only heart healthy fats, and containing moderate sodium levels. Yet these recipes are not lacking in taste. The recipes are so simple and delicious many of my clients purchase an extra copy to use at home. Who can blame them? These recipes have been tested in my own home with my family and friends during the last 5 years. "I'm hungry! 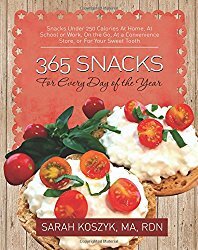 Time for a snack"
Snack Attack!This blog gets its name from the title of the first chapter in Sarah Koszyk, MA, RDN, new book, "365 SNACKS For Every Day of the Year". As a snacker Sarah, like me, and surely like most of you, loves snacks. But as a Registered Dietitian Nutritionist, she also knows the importance of good nutrition, eating the right foods, and maintaining a balance between calories and activity to promote wellness and avoid chronic diseases. But, what are you to do when your literally starving and don't have time for a meal? Sarah offers all of us a simple solution. 365 SNACKS has exactly that many snacks which can be prepared ahead or made the instant hunger strikes. Out of the whole book those were my favorite, since I get sudden hunger attacks and want to be able to reach and eat in minutes. But I'm sure that at the end of this month when I'm traveling to visit my accounts in L.A. I'll appreciate the healthy snacks I'm buying at the convenience stores. So far I've tried a few of the snacks in the book, and tonight my dinner guests will taste a few of the lighter ones. I can't describe them all so you'll have to read get the book, either the printed copy like mine or the Kindle version to have handy. As a matter of fact, why not get them both? That way when traveling and at work you can have a complete list of healthy snacks you can buy at convenience stores from Chapter 5. Or, if you have a sweet tooth, Chapter 6 has enough of them to fill your craving. All of these snacks are under 250 calories! Try it, you'll like it. At first glance, I'm sure most of you will say, what's she talking about? of course we eat food first, what else would we eat? The reality is that most people in this country are so busy and know so little about nutrition, that they fall prey to one of two ways of eating; processed foods, or commercially manufactured supplements claiming to have all the nutrition anyone would ever need. You see these ads in magazines and watch them on TV daily and end up believing them. Moreover, why not? it's so much easier than cooking for yourself, isn't it? My goal for many years has been to promote the use locally sourced, fresh and simple food prepared. As we age it's even more important to eat real food, and whether we want to or not, everyone gets older every day. Yes! Even you, dear reader. ​Why should you consider changing from using commercial supplements to high calorie, high protein foods? It is really a very simple answer. Individuals like to eat food and drink fluids that taste good, provide a variety of flavors, and incorporate their favorite foods. For example, where can you purchase a peanut butter flavored commercial supplement? It does not exist! But you can make your own. Traditionally the use of foods with more nutrition may have been called by a number of names - Every Bite Counts, Nutrition Intervention Program, Enhanced Food Program, Super Foods. Today, thanks to the Pioneer Network (http://www.pioneernetwork.org) Food First! is the term used for all of these approaches. There are many factors affecting the amount and type of food that some individuals are able to eat. There are also times regardless of the amount of food a person eats they just cannot gain any weight. Seeking medical attention is always the right course of action and should be done first to rule out the possibility of physiological or health factor. Individuals who are chronically underweight and who have difficulty ingesting sufficient amounts of food to maintain their weight will benefit from eating calorie dense foods. Calorie dense foods are foods that provide high calories and protein either naturally or because they are enhanced or fortified during food preparation with additional nutrient dense ingredients. Many factors may contribute to a decreased appetite or the ability to eat enough food. Chewing or swallowing problems sometimes decrease the appetite and keep the individual from eating enough. Alterations in taste and smell are often side effects of medications, a result of a disease or the aging process can affect the desire to eat adequate amounts of food and fluids. Commercially manufactured products enhance nutrients and are easy to use. However, many of these products are expensive and lack the palatability of a house prepared product. 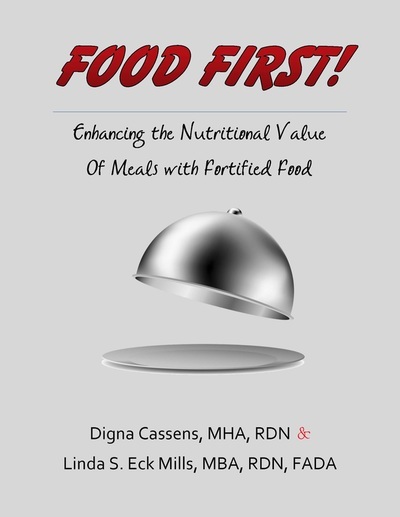 By using fortified food at meals and snack time in lieu of commercially prepared supplements you will be able to satisfy the most demanding palate, improve acceptance and consumption, and save money. What better way to meet individual’s nutrient needs than being able to offer them delicious, well prepared food that they will look forward to eating? Flavorful Fortified Food – Recipes to Enrich Life, ©2012 by Digna Cassens, MHA, RDN and Linda S. Eck Mills, MBA, RDN, FADA and Food First! 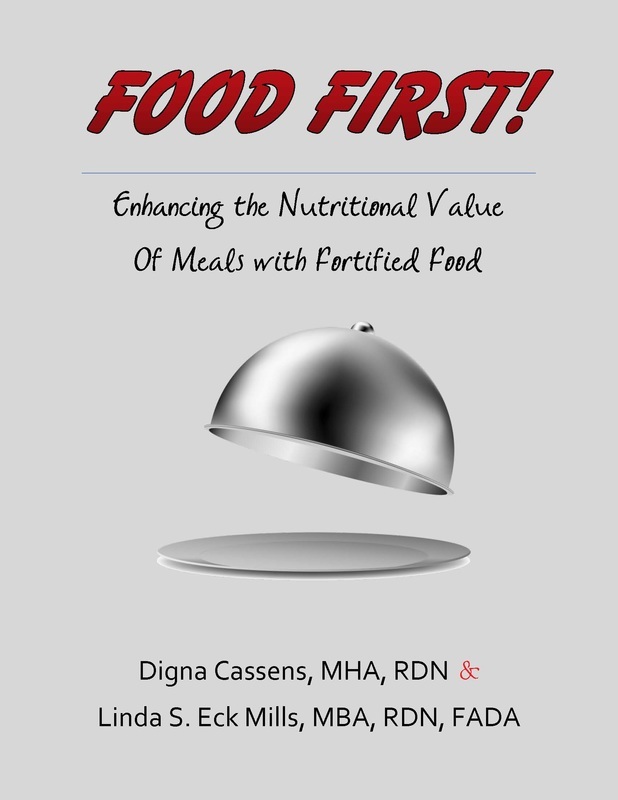 Enhancing the Nutritional Value of Meals with Fortified Real Food – Creative and Survey Friendly Supplement Program ©2014 is the start to change. The 60 high-calorie, high-protein recipes (beverages, bread and cereals, desserts, main dishes, sauces and soups, and side dishes) provide quantities for both one and ten portions. The continuing education program, which supplements the recipes, is designed to learn how to provide a food fortification program, the New Dining Practice Standards, and Centers for Medicare Medicaid Services (CMS) requirements. (www.flavorfulfortifiedfood.com) . Why not get your copies now before the holidays? I've always thought that bananas somehow got a bad rap from the English language. To my knowledge, and I've searched, no other language uses a fruit to describe a mental state. But no mater what the connotation is, I'm crazy about bananas. Of all the available fruits, they're one of my favorite, and with so many to pick from, sometimes I go crazy deciding which varieties to pick. I read somewhere there are at least 1000, divided into 50 groups. Now that's really crazy, isn't it? Or at least a bit weird; that one fruit has so many different varieties, yet they're all so delicious and good for you. Bananas are one of the most amazing fruits in nature. They’re enclosed in their own tight, impermeable protective skin that requires nothing but your bare hands to peel off and can be eaten out of. Bananas are an excellent source of carbohydrate and potassium. Their color changes to let you know their stage of ripeness, and if you miss the best time to eat them and they turn spotty, you’ll have a fantastic ingredient for baking. Bananas are in the botanical class of berries and they grow in a variety of trees in the genus Musa and are available all year. Green bananas are on the hard side and a bit tart, as the carbohydrate has not fully developed into sugar; they're best cooked. 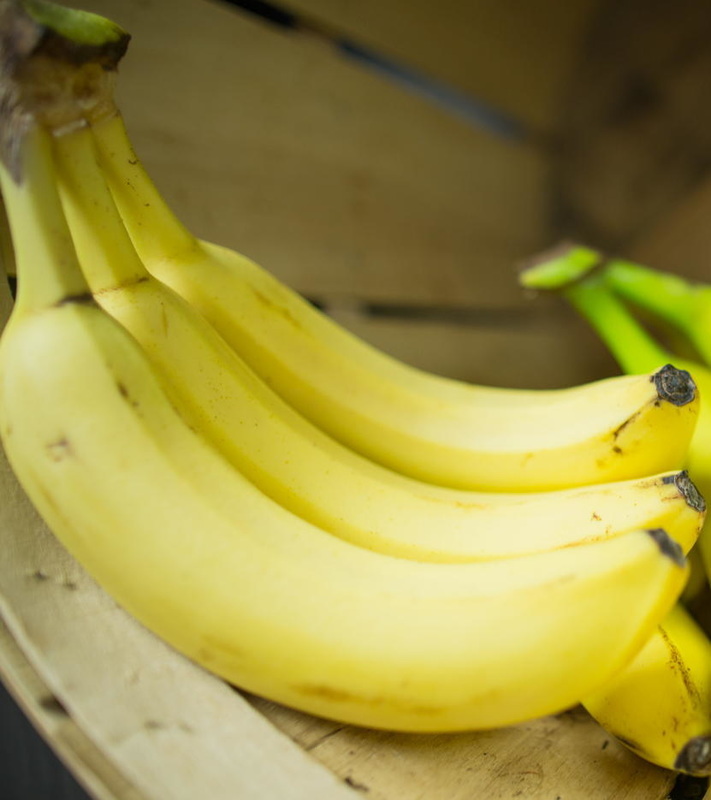 As bananas ripen they become sweeter and softer; most people prefer to eat them while they’re still at the “green-tip” stage, a little firm with a sweet creamy taste. ... the inside of its peel is good for relieving itchiness from bug bites, and some people have been known to even use it for leather polish​How about making some sweet banana treats? ​Today I'm sharing with you one of my favorite and most unexpected banana treats. A cooked banana pudding pie. It's so easy that after the first bite, it will become your favorite too. Like most puddings, it's good cold or warm. 2.Cut a 1” slit lengthwise on top of each banana and place side by side bananas on a flat sheet pan. Cover the top with parchment paper to prevent scorching. 3.Bake at 350°F for 20 minutes; do not turn off the oven yet. 4.Remove 3 bananas and cool. When cool enough to handle, peel and cut into 1/2-inch-thick slices. 5.In the meantime, continue baking the 2 bananas remaining in the oven for an additional 20 minutes. While still warm, carefully peel and place the 2 bananas in a small bowl, mash with a fork to remove all the lumps. 6.Combine milk and 1/3 cup sugar in a saucepan over medium-high heat. Bring to a simmer to dissolve sugar (do not boil). 7.Combine remaining 1/3 cup sugar, cornstarch, salt, and eggs in a medium bowl; stir well with a whisk. 8.Temper the egg mixture by gradually adding about ¼ cup of the hot egg, sugar and cornstarch mixture to the milk and sugar, stirring constantly with a whisk. Immediately return the tempered milk mixture to egg, sugar and cornstarch pan. 9.Cook over medium heat until thick and bubbly (about 3 minutes), stirring constantly. Be careful not to scorch. 10.Remove from heat. Add the mashed bananas, butter, and vanilla and mix well, then stir until the butter melts. 11.Place pan in a large ice-filled bowl for 15 minutes or until mixture reaches room temperature, stirring occasionally. Fold half of whipped topping into pudding. 12.Spread 1 cup custard evenly over the bottom of an 11 x 7-inch baking dish. Top with half the vanilla wafers and half of the banana slices. 13.Spoon half of remaining custard over bananas. Repeat procedure with the remaining wafers, banana slices, and custard. Why not try these variations? Pollination is vital to your diet. 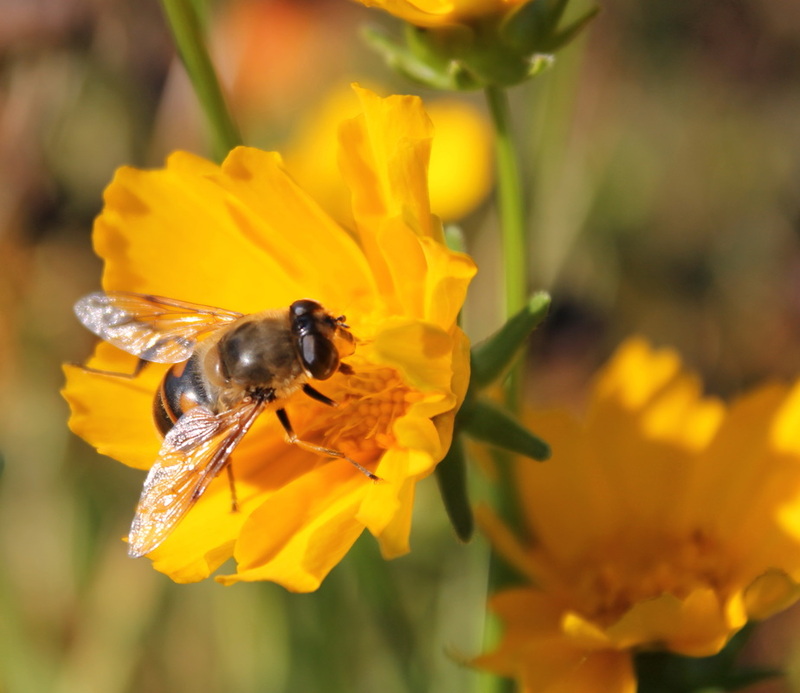 More than 100 agricultural crops in the United States are pollinated by bees. Without bees to pollinate many of our favorite fruits and vegetables, the United States could lose $15 billion worth of crops – not to mention what it would do to your diet. Researchers call the mass disappearance of bees Colony Collapse Disorder, and they estimate that nearly one-third of all honey bee colonies in the country have vanished. Bees are unwittingly killed daily by well intentioned, albeit ignorant gardeners using pesticides. Most recently, Naled, a deadly poison developed in 1959 and never tested since, was sprayed from airplanes in a fine mist in attempts to kill the Zika mosquito, decimating millions of bees. Yes! Millions! Daily other pesticides are used in smaller amounts containing Clothianidin, Carbaryl, and neonicotinoids, or neonics. All will poison honeybees, bumblebees and monarch butterflies as well as all the pollinating species. It’s important to know that although some insecticides kill the bees instantly on contact, others have slow effects that may last for up to 3 days before the bee dies. Neonics are slow acting. The treated seeds sprout into crops that when eaten by the insects act by slowing down their nervous system, shutting it down, causing the bees to lose their ability to learn and communicate. We all agree that controlling many insects is important, especially when those insects cause devastating harm, such as the Zika virus. However, while attempting to control the short-term danger, we cannot afford to create long-term even more damaging danger. If we don’t act now to save the bees it might be too late. And no bees will mean an end to your favorite fruits and vegetables. Can you imagine life without almonds, apples, apricots, avocados, blueberries, cherries, cranberries, grapes, olives, peaches, pears, plums, raspberries, strawberries, broccoli, carrots, cauliflower, celery, cucumbers, onions, pumpkins, melons, peanuts, soybeans, sunflowers? And the list goes on to include honey which is part of many foods we enjoy. Celebrate September National Honey Month. Help save bees. Incorporating eggs into every day foods and beverages is an easy and inexpensive way to increase high quality protein in your diet. My favorite way to eat eggs is deviled. Every week I buy a dozen medium eggs just to make Deviled eggs. The size of the eggs is not important, but the medium size happen to fit perfectly in my Deviled egg keeper and I can eat a half in one bite. I’m not sure where the name came from, and I always called them stuffed eggs, the name we still use now. I figured I didn't need to give my daughters and grandsons any ideas they hadn't already come up with by themselves. Deviled eggs aren’t just a party food. I like to use them for snacks and small meals paired with a whole grain bread or cracker and vegetable. Once you find the right container they keep well and last for up to a week refrigerated at 41°F. But, I bet they won't last that long. Try them for school lunches and you'll be the most popular mom at school. My children and their friends always thought that only sweet treats came in small bite size finger foods, so imagine their thrill and their friend’s wonder when they unpacked a bunch of “treats” for lunch. Now I make sure I have them available every weekend when our friends drop by. Maybe that's why they drop by, for my Deviled eggs! Today’s busy life style seldom allows time to prepare special, nutritious meals, so most people resort to supplement drinks or bars. Athletes in particular struggle to fit in work or school, social life and other obligations, and extensive workout routines, and for some finding foods that provide enough calories and protein is a problem. Since most of the available supplements are sweet, there is often flavor fatigue involved after only a few weeks of taking them. Try these Deviled eggs. This method is nutritious, and so easy you don't need a recipe. Cut hard cooked eggs in half lengthwise and carefully pop out the yolk. If it gets stuck use a small teaspoon to pry out without breaking the whites. Arrange the whites cavity side up and sprinkle a small dash of salt and pepper over them – I like to use a salt and pepper grinder on the coarsest setting. Mash the yolks with a fork then again with an upside down teaspoon to break any lumps. Mix mayonnaise, your favorite prepared mustard, Cayenne, Chili powder, garlic powder, cumin and oregano. It’s best to add these to your own taste, as I like my food very spicy and some of you might not. Taste and adjust salt and pepper – you can’t forget the pepper! Add the dressings and seasonings mixture to the mashed yolks, mix well. It should be thick and hold its shape, but not too dry. My favorite way of eating eggs is paired with cherry or grape tomatoes. 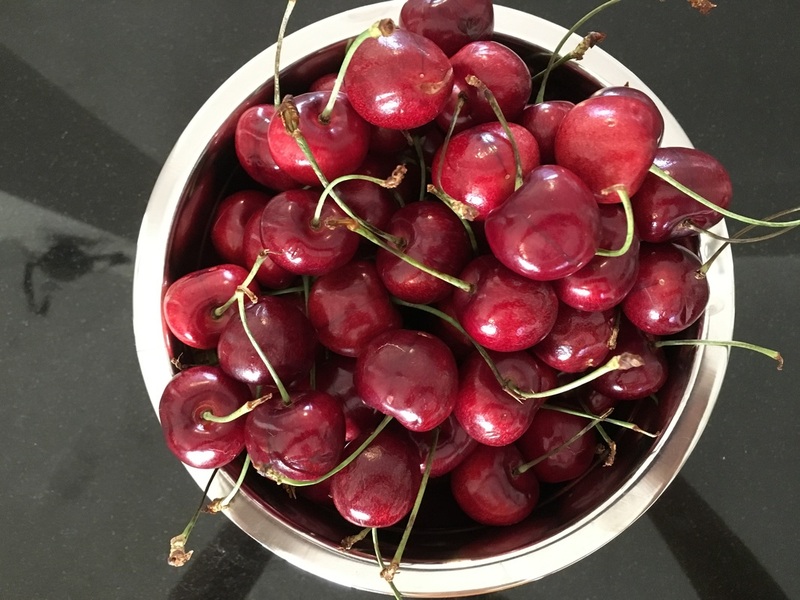 I love fresh cherries and am so sad that the cherry season will soon be over, but I'll get over it, because there are so many other fruits to think about. During the season, I buy a pound a week, put them in a bowl, and they’re gone in about 3 days. What a wonderful fruit! Like my husband's dear mother used to say; they're not only good, but they're so good for you. Cherries red color is lovely, and when biting into that plump, luscious cherry, the taste is without doubt one of the best in fruits. There are two kinds of cherries, sweet and tart, and although the taste and use of each is quite different, both have similar health benefits. I recommend tart cherry juice to my clients with gout and inflammation and most have reported beneficial results. As with all foods, although flavor is important, the health benefits of cherries is definitely the main reason we should be eating them. What is your favorite cherry recipe? Feel free to share it with us. One of my favorite summer fruits is watermelon. I confess that my husband and I often eat one whole watermelon a week. Not the small ones either, but the big ones, and I like them with seeds, although the seedless are the most popular now because of the convenience. Do you know why I prefer the ones with seeds? The seeds, when eaten, are full of nutrients too and add to your daily fiber intake. And frankly, seeds slow you down' so you can fully enjoy the wonderful, crisp, juicy taste of watermelon. Why all the fuss about the good stuff you get from watermelons? 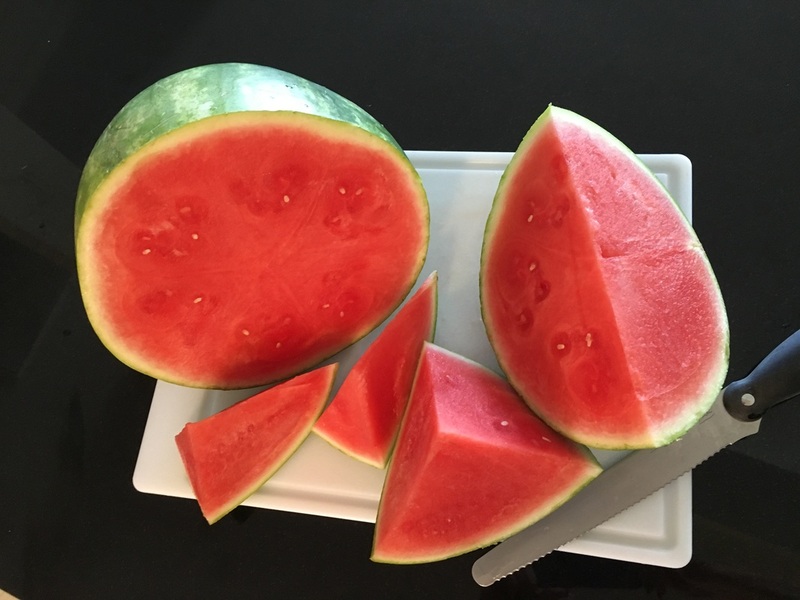 In addition to having a 92% water content and providing hydration, watermelon provides a significant amount of vitamins a, C and B6 plus fiber. The biggest benefit for me is the high amount of lycopene I get from watermelons, a phytonutrient that benefits eye health and is linked to bone and heart health and prostate cancer prevention. One cup of watermelon has a mere 46 calories and 7 to 10 milligrams of lycopene. 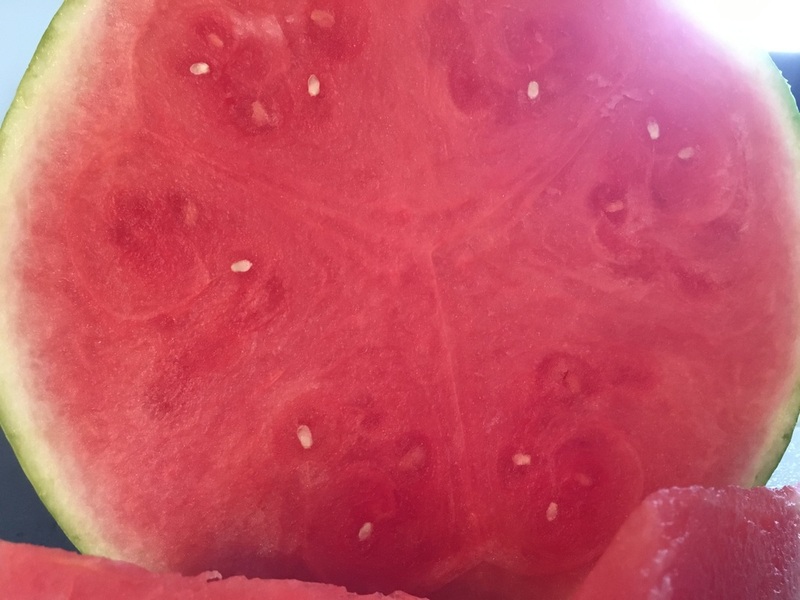 I prefer my watermelons very ripe, because then they have reached their peak in sweetness, and the deeper red of the meat is indication of the higher lycopene and beta carotene contents. In addition, it is reported taht watermelon juice is use to prevent muscle soreness after intense workouts. Many athletes are now juicing watermelon and drinking the juice before and after workouts not necessarily for hydration, but to prevent muscle soreness. The juice of watermelons contains I-citrulline, an amino acid believed to protect against muscle soreness. Since the juice of any fruit is high in fructose, unless you’re engaged in a high level of activity, it’s best to eat the fruit itself. Freezing watermelon will preserve it almost indefinitely but I guarantee it won't last that long. Freeze watermelon balls, cubes or slices, and eat frozen or process into a frothy, icy drink. You can make these at home for a drink as hydrating as water but with the additional benefits of providing fiber, antioxidants and vitamins. Did you know that all parts of the watermelon are edible? When you cut into a watermelon there’s no waste. Nothing speaks summer like having light, easy meals that require little or no cooking. But let's face it, often we get tired of grilling outside, especially on those very hot, sweltering days with no breeze, or worse, the days when the wind picks up to over 30 MPH in the evening, and then the fire does not stay on in the grill. For those days when you're hungry and don't want to spend a few hours preparing a meal, or let's face it, when nobody feels like cooking and you just want an easy no cook meal, tacos are the perfect choice. Depending on the protein used a bit of cooking might be required, but otherwise it's mostly chop, heat and serve. Crack open a frosty beer or pour a glass of your favorite summer wine, and feast on these fish tacos. The options are limited and I also make a variation for a quick and easy weekend breakfast (served without the beer of course). In a medium non-stick skillet add EVOO and heat. Add the chopped peppers, sauté until soft. Fill each tortilla with serving 3 ounces fish, ¼ cup lettuce, 1 tbsp cheese, ½ of the chopped scallion, 1 tbsp sour cream, and 1 tbsp salsa. 377 calories, 30g protein, 28g carbohydrates, 16 fat, 3g saturated fat, 0g trans fat, 58mg cholesterol, 133mg calcium, 452mg sodium, 463mg potassium, 2506 International Units Vitamin A. You may use any type of protein you prefer for the filling. Choose from shrimp, crab, lobster, beef, chicken, pork, beans or tofu - there’s no limit to what you can do with this recipe. I often use leftover meats or fish, or buy fresh salmon for a completely different taste. When using salmon I add fresh dill to the rub. When using salmon I also add chopped cucumbers to the taco. For a breakfast taco use half the fish and add one scrambled egg per taco. Some ice cream maker instructions have the ice cream "cure" right inside the churning bowl. Others have you transfer it to a chilled freezer safe bowl. This is the July 4th weekend! Independence Day for the USA. I haven’t read statistics but I’m certain it’s the favorite holiday of the year, second only to Christmas. And why not? It’s summer and warm, school’s out, many take vacation, and this great holiday to break up the routine. Whatever you do on this holiday I’m sure there’s food involved. BBQs are very popular all summer long and of course for holiday festivities. But if the day is smoldering hot, it’s best not to be near any fire, even a BBQ fire outdoors. During hot weather I like to serve cold foods. Why don't you change your holiday menu and serve cool, refreshing foods too? One of my favorites and my tastes run towards the Spanish foods of my heritage, one of my favorite foods is Gazpacho; it's flavorful, hearty, low in fat and chock full of nutrition. This one is from my personal collection. The addition of garbanzos makes it a complete meal. Pour tomato juice over marinated vegetables and stir to mix well. 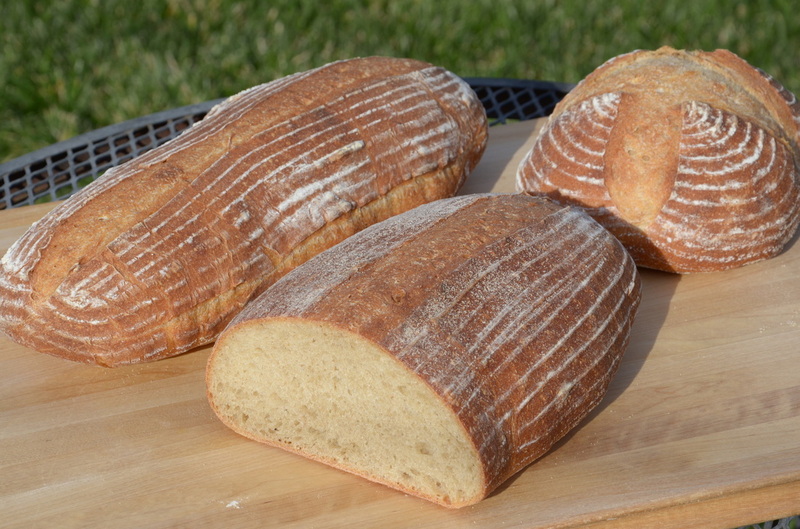 Cover tightly and refrigerate overnight or for up to 24 hours at 41°F. The longer it sits the more flavors develop. This is the perfect cold soup to take on a picnic. Pack in wide mouth thermos or tightly covered serving bowl to carry and keep refrigerated, or pre-portion in cups with tight lids for convenience. Don’t forget the spoons! Beat the heat drinking water! Extreme heat often decreases the appetite. If you're concerned about maintaining your nutrition and keeping yourself and your family well fed during these blazing hot days, do what I do. Chilled soups such as Gazpacho and Vichyssoise are among my savory favorites. Smoothies are always welcome and well accepted by children and adults and can be packed with nutrients by choosing the right ingredients. Check some of these out in Flavorful Fortified Food - Recipes to Enrich Life. With 30 nutritious beverages to choose from you can make one for each day of the month. Protein - What’s a guy to do? Father’s Day arriving soon and it’s a good time to think men's health. What about their nutritional needs as they age? Focusing on nutrient dense foods, lots of fruits and vegetables works for men, as well as women. But, men’s physical make-up is different than women’s ~ more muscle, less fat. As we age, we lose this lean body mass, so “what’s a guy to do” to combat this natural aging process? How much protein do men need? 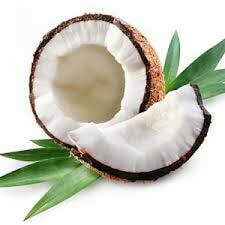 The DRI (Dietary Reference Intake) is 0.8 grams of protein per kilogram of body weight, or 0.36 grams per pound (1). This amounts to (2, 3): 56 grams per day for the average sedentary man. There is new evidence that focusing on good dietary protein sources increases longevity, helps build and retain muscle mass, and contributes to overall health, wellness and quality of life. By “good”, we simply mean lean cuts of meats, fish, legumes, grains, eggs, nuts and dairy products. Lean meat means selecting meat cuts with a lower % fat content and removing visible fat. Dried legumes have the benefit of being budget friendly selections, and when prepared at home you can control salt used in preparation too. The increasing market availability of “world grains”, including popular quinoa, makes it easier to try new recipes and flavors. These high protein per serving grains have found their way to salad bars, restaurant menus, store shelves and grocery ready made meal sections. Switching to fresh, locally sourced products instead of processed foods is a must for long-term health. 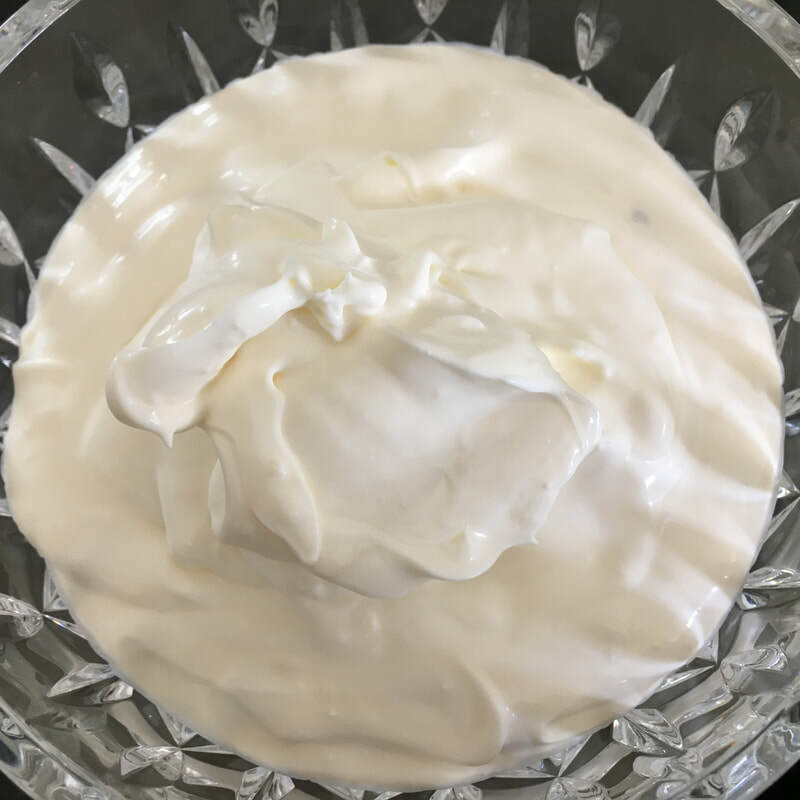 Greek yogurt provides twice the protein per serving of other yogurts, and makes a great substitute for sour cream or mayonnaise in recipes. Have you tried goat, almond or soy milk lately? These fluid cow's milk alternates for both cooking and consumption show their popularity as their store shelf space increases. If you choose one of these products, be sure to read the label, since almond milk only has 1 gram of protein instead of the 6 to 8 grams that cow’s, goat or soy milks have. Why not make a new smoothie recipe using your favorite milk or milk substitute? You can find 30 different protein drinks in Flavorful Fortified Food - Recipes to Enrich Life. Simple and quick recipes to add good dietary protein into your daily life. What’s a guy to do? Well, does a Peanut Butter Banana Milkshake sound good today, or a Rich Coco-Nutty Shake? With 30 smoothie and beverage recipes, all high in protein, you have a whole month’s selection ~ what could be easier? Contributed by Suellen M. Scarff, M.S., R.D., Board Certified Specialist in Gerontological Nutrition Suellen shares her practical nutrition suggestions on this blog and with her clients in her private practice. There are many reasons for practitioners to consider changing from using commercially manufactured nutritional supplements to nutrient dense real food. Although commercial nutritional supplements are convenient to use and provide high calories and high protein, people like to eat food and drink fluids that taste good, provide a variety of flavors and like their favorite and familiar foods. For example, where can you purchase a peanut butter flavored commercial supplement? It does not exist! Commercially manufactured products enhance nutrients and are easy to use. However, many of these products are expensive and lack the palatability of a house prepared product. By using fortified food at meals and snack time in lieu of commercially prepared supplements you will be able to satisfy the most demanding palate, improve acceptance and consumption, and save money. What better way to meet individual’s nutrient needs than being able to offer them delicious, well prepared food that they will look forward to eating? Traditionally the use of foods with more nutrition may have been called by a number of names - Every Bite Counts, Nutrition Intervention Program, Enhanced Food Program, Super Foods or Food Fortification Program. Today, thanks to the Pioneer Network initiative started in 2010, and updated Centers for Medicare and Medicaid, Food First! is the term of choice for these approaches. There are many factors affecting the amount and type of food that some individuals are able to eat. There are also times that regardless of the amount of food a person eats they just cannot gain any weight. Seeking medical attention is always the right course of action and should be done first to rule out the possibility of physiological or health factor. Individuals who are chronically underweight and who have difficulty ingesting sufficient amounts of food to maintain their weight will benefit from eating calorie dense foods. Calorie dense foods are foods that provide high calories and protein either naturally or because they are enhanced or fortified during food preparation with additional nutrient dense ingredients.ere to edit. Cucumber - isn't it cool? How about a crisp, crunchy, hydrating and deliciously refreshing cucumber to celebrate this Memorial Day weekend? I can’t think of anything better. As you picnic or BBQ outdoors, cucumbers will help keep you cool, so take many with you, and don’t hesitate to serve them in many different ways. The best thing about serving cucumbers is that they’re as nutritious as they’re delicious. There are 100s of varieties, enough to satisfy every palate and be suitable to serve any way you’d; raw or pickled. Cucumbers are known to be rich in phytonutrients such as flavinoids, lignans and triterpenes. They also provide small percentages of your daily needs for potassium, magnesium, manganese, fiber and vitamins C, K, and A. Since the vitamin A is in the form of Beta Carotene cucumbers are good for your eyes and vision health. Quite a feat for a pale, bland tasting vegetable, isn’t it? Are you counting calories? 1 cup of diced cucumber is only about 16 calories with the peel, about 15 without the peel. I recommend leaving the peel for additional crunch and twice as many nutrients as well as fiber. For the most nutritional benefits don’t peel or seed the cucumbers before eating, since the peel and seeds contain twice as much Beta carotene and fiber as the pulp and the seeds contribute minerals and calcium. The claims that cucumbers contribute to cancer prevention have not yet been proven, however, since they already contribute so much to your pleasure and nutrition, why not eat them often anyway? If you have swollen eyes, try placing a slice of cold cucumber on your eyes for a while. You’ll find their soothing effects will decrease swelling and inflammation. If you get a sunburn, place sliced cucumbers over the affected areas for a cooling effects. Do you have a special cucumber recipe you'd like to share with us? Post to our Face Book page or email me and I'll post it for you. I skipped last week’s blog, since it was a travelling week for me, I thought. But the reality is that although I’d planned to write about “tuna” one of the ingredients in my recipe book, and I love tuna and could eat it every day, there are somewhat sad news about tunafish today. So maybe it was avoidance? My favorite way to eat tuna is canned water packed tuna made into a salad. A nice, calorie conscious Nicoise or a scrumptious American traditional tuna salad or tuna salad sandwich. I like canned tuna because it's high in protein and as an oily fish high in Omega-3. It's tasty and if packed in water it's low in fat, therefore calories. For a quick lunch or afternoon pick-me-up you can't beat it. And there are many ways to make a can of tuna into an economical, nutritious complete meal. However, many sources are now advising to eat tuna not more than once or twice a month. I'm not talking fresh, wild caught tuna, the kind you struggle to catch yourself when sport fishing in Baja. I'm talking about most of the tuna that's caught in nets, in large quantities, as a business to be processed into the canned product. The reasons are both environmental due to sourcing methods, and safety due to the amount of mercury found in canned tuna. So what am I so sad about that I avoided writing this blog for a whole week? It wasn't avoidance as much as concern that I should present the whole picture about tunafish, and especially canned tuna. So, I took my time and did some research, reading as much as I could and gathering so much information that a short blog would have turned into a long book had I tried to present it all. So, insead, I'm giving you some information and a lot of homework. Like most processed foods, there are endless lists of the best and the worse of them. Here is my list from Greenpeace in ascending order from best to worse. Note that only the first 3 on this list are considered “safe” both because of the fishing methods and the amount of mercury exposure provided. The consensus in all the articles I read is that as long as you choose one of the top 3 canned tunas, it's OK to eat it weekly, but you should ensure it's canned light tuna. Why? you ask. Keep reading and find out why. Below is some of the information I came up with. You can help me decide. To help you make the best choices for you, please check the URLs I’m including after the “best to worse” list for additional information about tuna, it’s benefits an potential risks. Whatever you eat, be informed before you do. Let's get back to the fun topic of food, recipes and eating. When you eat tuna, you have many choices. And one of them is what recipe to use. For an energy packing meal whether in a salad or sandwich, I like my own recipe, published in my book, Flavorful Fortified Food - Recipes to Enrich Life. You will find it on page 48 and I guarantee you'll love it.